Intellectual property law protects the owner of each patented invention or copyrighted work of authorship with a largely uniform set of exclusive rights. Historically, this uniformity may have been justified in light of the relative homogeneity of market conditions applicable to protected subject matter, such as books or mechanical inventions. Technological progress since the founding has led to considerable growth in the range of inventions and expressive works to which patent and copyright law apply, respectively. In the modern context, it is clear that innovators’ needs for intellectual property protection vary substantially across industries and among types of innovation. 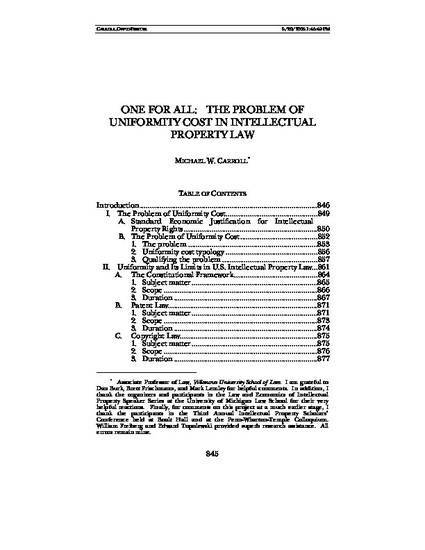 Applying a socially costly, uniform solution to problems of differing magnitudes means that the law necessarily imposes uniformity costs by underprotecting those who invest in certain costly innovations and overprotecting those with low innovation costs or access to alternative appropriability mechanisms. This Article argues that reducing uniformity cost is the central problem for intellectual property policymaking. There are three approaches for reducing uniformity costs: (1) granting real options to obtain or maintain intellectual property rights (such as renewable terms); (2) using standards rather than rules to define rights, thereby making their application more context-sensitive; and (3) tailoring rights legislatively or judicially. This Article focuses on the ways in which current law deploys these approaches to reduce uniformity cost and argues that recent changes in the law have exacerbated the problem of uniformity cost.